Today was the penultimate day of the two weeks of the ESD dimensions as tomorrow the class will go on a field trip to finish off the sessions on this topic. Dr Klaus Hahne, a chief researcher for vocational training gave a presentation to the class on this topic. Dr Hahne gave a talk on aspects of sustainable development, including ecological footprints and sustainable energy before discussing the issues of SD in vocational training schools. In particular he outlined the impact ESD is having on this as well as how the vocational training works to give the trainees practical experience in their chosen field. After Dr Hahne had finished his presentation, Anne Mette was left to facilitate the rest of the session. The rest of this was devoted to ESD in the education system and a large task was set for the participants in group work and then individual tasks. 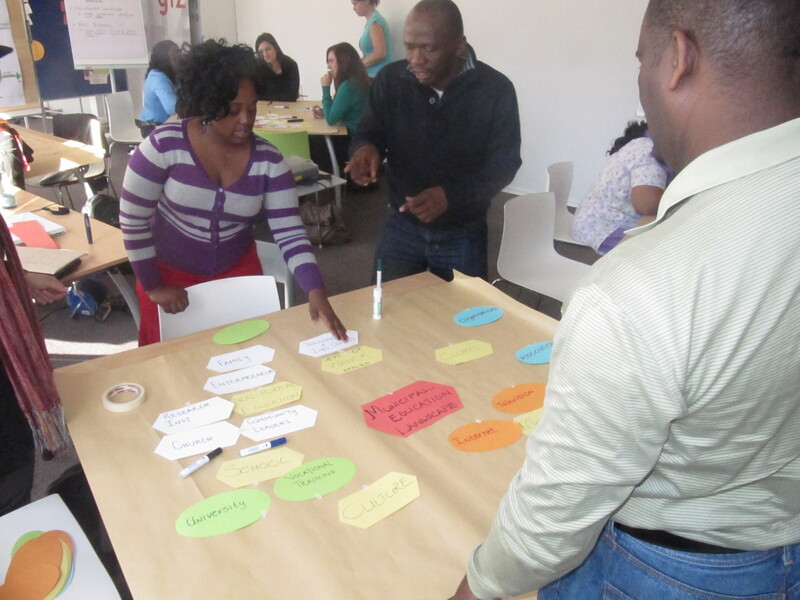 The group work led the groups to develop their own educational landscape and to create a vision statement for this. These were then presented as usual to the rest of the groups and discussed at the end. It is worth pointing out how the work done in the past two weeks (and all used to develop the landscape) will be linked with next weeks training sessions. The individual participants came up with the idea to change the second part of the group project to become individual projects. These were the ESD biographies showing the lifelong learning along an educational landscape. Once these are complete they will be uploaded to the Global campus. Dieser Beitrag wurde unter 2011 | ESD LT, English veröffentlicht. Setze ein Lesezeichen auf den Permalink.